Twenty-four interfaith leaders. Twelve days. Six cities. 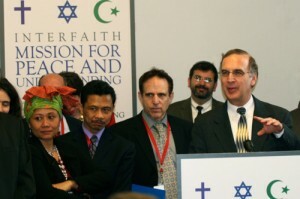 The Interfaith Mission for Peace and Understanding was an exploration of the role of religion in advancing peace and understanding in the world. Over 12 days, from February 18-29, 2012, twenty-four leaders of the Abrahamic faith communities in the United States and Indonesia undertook a journey across six cities and meet with senior government officials, NGOs and other interfaith leaders to engage in the challenges that confront us in promoting peace, mutual understanding and trust throughout the region and world. The Mission came about based on a relationship that Rabbi Sid developed with Dino Djalal, the Indonesian Ambassador to the United States. Ambassador Djalal asked Rabbi Sid to develop an itinerary and recruit 12 nationally prominent American faith leaders, equally divided between Christian, Muslim and Jewish faiths. On the Mission’s first stop in Jakarta, the Mission added 12 Indonesian faith leaders, both Muslim and Christian. From there the Mission traveled to Amman, Ramallah and Jerusalem meeting presidents, prime ministers, cabinet members and nationally prominent peace activists. When the Mission concluded in Washington D.C., briefings were held at the State Department, on Capitol Hill and at the White House. Mission Director Rabbi Sid Schwarz speaks before mission participants and the press.